For Rotterdam natives and people in the vicinity thereof, Bird is without a doubt tha place to be on the 27th of May. Simply cause Damon G. Riddick a.k.a. Dâm Funk is about to raise tha motherf*ckin roof!! 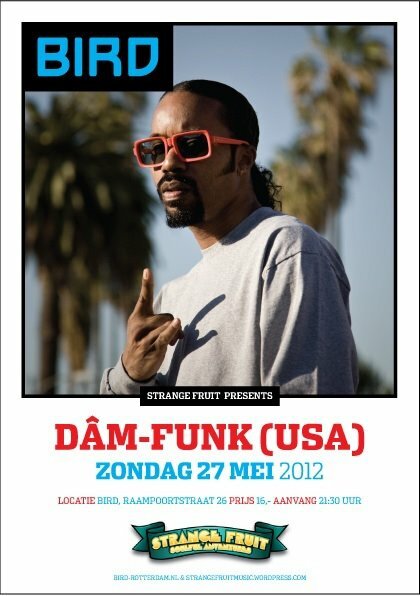 Known as Los Angeles’ “Ambassador of Boogie Funk,” Dam-Funk represents the citizens of the Funkmosphere. Headquartered in the Leimert Park section of L.A., Dãm spent the last few years cultivating a musical renaissance rooted in the early-’80s styles known as Boogie, Modern Soul and Electro-Funk. It was never hard to feel tha flevah of Mr. Funk’s 80’s groove, but I was officially hooked when he hit us up with the visuals for “Mirrors”, taken from his album Toeachizown. Needless to say that after that everything Dam Funk was a good reason for a blog post. By then most fans were aware of Dam Funk’s keyboard, production and mixing skills. But I think he definitely left us speechless when he decided to do his rendition of Human League’s “Things that dreams are made of” for Dr. Martens 50th anniversary … like it or not he sure as hell nailed the spirit of the 80’s with that one. I can go on and on about past productions, but I think it’s better when you actually experience the genius of Damon G. Riddick. The best way to go about that would be to repost something that demonstrates his production, keyboard as well as his vocal skills… and of all the freebies the most recent, the Innafocuseddaze EP, pretty much showcases all of his talents. The best part is that you can still download the all of tracks to hold you down till upcoming Sunday!! Guess I’ll see you on Sunday! !